Urinetown isn’t the catchiest title for a musical – but then urination isn’t the most appealing subject for a theatre production. Nevertheless, Urinetown does indeed follow the trials and tribulations of a community in its quest to go to the bathroom. In a Malthusian dystopia where environmental catastrophe has led to prolonged drought, the population is overwhelming the world’s resources. The severe water shortage has created a unique business opportunity for Caldwell B. Cladwell; with private toilets now unthinkable, citizens must pay him for the privilege to pee – or be dispatched to the eponymous Urinetown. As Cladwell presides over his lavatorial empire, the scene is set by Officer Lockstock. His self-knowing asides could have been grating in lesser hands than those of Jonathan Slinger, who keeps the narration fresh and the action flowing. They do also allow the musical’s dialogue to remain relatively free from unnecessary exposition. While throwing out some thought-provoking themes and questions – the corrupting influence of power, is history doomed to repeat itself? – Urinetown sometimes lacks emotional punch. This isn’t to fault the cast, who are fantastic. Jenna Russell relishes her role as Penelope Pennywise, giving her an air of Mrs Lovett – interspersed throughout the musical are parodies, pastiches and tributes to musical tropes and there are several Sondheim-esque moments. Richard Fleeshman has leading man charisma as Bobby Strong, leader of the revolution against Cladwell, and the whole cast perform with such gusto that you can’t help but be swept away with them. Run, Freedom, Run – a catchy gospel number – received the longest mid-performance ovation I’ve ever seen. Urinetown’s slightly facetious tone may sometimes have failed to tug at my heartstrings but its unexpected plot twists certainly kept me guessing. Urinetown is keen to point out that it’s not a “happy” musical. But neither is it a self-indulgent tragedy. Despite its seemingly far-fetched setting and slightly cartoony style, Urinetown is actually quite a pragmatic look at politics and society. When storytelling, the most glorious revolutions are often the unsuccessful ones. Take Les Mis – there’s a reason it’s set during the 1832 Paris Uprising rather than the more famous eighteenth-century Revolution. Marius and the Friends of the ABC capture our hearts as the underdogs fighting for a doomed cause against the establishment. The rebels of Les Mis die idealistic (if naive) martyrs. If instead of dying on the barricades the revolutionaries had succeeded, who’s to say that there wouldn’t have been a repeat of the violence, war, in-fighting and Reign of Terror that followed the French Revolution of 1787. And that would have made for a very different story. Without giving too much away, Urinetown is no Les Mis, and offers a much less romantic take on revolution. While it seems ironic that Urinetown opened to a country beset by widespread flooding, it brings home the immediate impact of environmental issues. And the fact that difficult questions – environmental or political – don’t have simple answers. On a more practical note, it was my first time at the St. James Theatre and I found myself on the front row, not having bargained for quite how close to the action I’d be. If you like inspecting actors’ fillings and don’t mind the odd spray of saliva my seat comes highly recommended, but if you like your personal space I’d think about sitting a few rows back. The Pride, the third production in Jamie Lloyd’s Trafalgar Transformed Season, follows the complex relationship between Philip, Oliver and Sylvia as they live their lives simultaneously in 1958 and the present. Both plot strands are engaging, and it’s interesting to see two takes on a group of characters defined by their time. Yet at times the play seemed somewhat directionless, perhaps because of the jumping narrative. Or maybe this confusion is a reflection of the mental state of many of the characters. Harry Hadden-Paton gives a brave performance as a closeted gay man constricted by society and his own crippling self-loathing – a stark contrast to his modern counterpart. Both Hayley Atwell and Matthew Horne also give strong performances, yet Al Weaver stands out with his absorbing performance, bringing an appealing vulnerability to a character that could have become grating in less able hands. The programme has an interesting discussion about ‘gay’ plays, and the categorization of the work of gay playwrights. The parts of The Pride set in the present are perhaps best described as a portrait of a foundering relationship (incidentally a gay one). Yet people like to categorize, and by alternating between the present day and 1958, Alexi Kaye Campbell brings the issue of society’s attitude to homosexuality centre stage. This is emphasised by a tipsily self-righteous monologue by modern-day Sylvia about the casual use of the word ‘gay’ as an insult. It is apt that the play, which examines the social and political persecution of gay men, is being performed against the backdrop of protests at Britain’s participation in the Russian Winter Olympics. 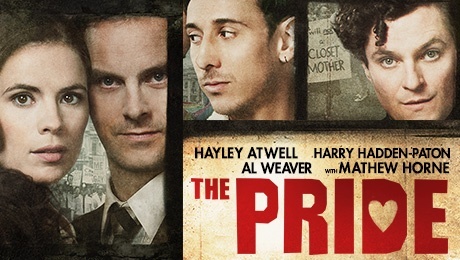 The Pride is an interesting exploration of relationships, and the impact that society has on the choices (and personality) of the individual. It is held together by a strong ensemble cast, and is well worth a look.